Mithun costarring with...a goat...who is a graduate...of "Devar's Film Institute of Animals"*! WOW. Does anyone know if this school is just part of the film or is it a real thing? I looong for it to be a real thing, producing top-notch graduates who feature in films for decades, including superstars like Moti, Charles, Pedro, and the Subliminal Marmoset featured in the Animalympics. 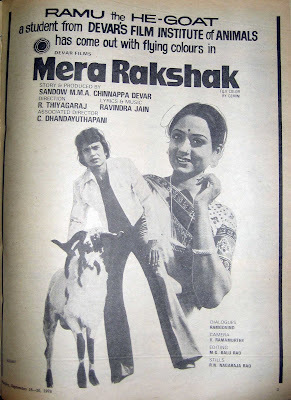 * PS I strongly advise against googling "Devar's Film Institute of Animals." Baaaaad things happen. Oh there will be plenty more. I'm just so fascinated by the magazines at the moment! There's a movie review in progress but the film is very difficult to think about, so it's slowwwww writing. It's better they don't exist, because I would just endlessly harass them with prank calls, asking them if they could make a superstar out of my flatworm, snail, parameceum, etc. Devar was a big producer in Tamil Film industry. He used lots of animals in his films. Looks like this was a remake of a hit tamil movie.